International Bazaar is an annual event where imported, local goods and merchandise are sold to the public, the proceeds are used to finance projects to those who are most in need of assistance. 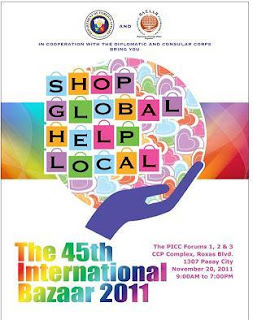 Dubbed as a "shoppers' paradise where the diplomatic and consular posts in the Philippines, as well as local entrepreneurs, sell choice and unique merchandise." International Bazaar 2011 will be at the Philippine International Convention Center (PICC) Forums I, II and III at the CCP Complex on November 20 from 9:00 a.m. to 7:00 p.m.
Tickets are P100 only. Please call them at 833-13-20 / 834-3054 (phone) or email ibf.dfa@gmail.com.